So, does this card stop working if you control more than one Ancient One? Yes. The ability only works for exactly ONE Ancient One as stated on the card. So, if you have an Ancient One and one or more Beings of Ib in play - just don't play another Ancient One. for effects like this so if you commit this guy and the ancient one at another story your basically playing like you have two copies of the guy in play correct? as in this doesn't stop the ancient one from counting his icons at the other story? Assuming I am right but just double checking. Curious.. If you have the ancient one and a Beings of Ib commited to the same story, would the icons and skill be counted twice? So, Iod has just come along to provide a cheapish option for Beings of Ib. Sure, they will cost 1 to play so its only an option for a green deck, but I think there's definite potential there. 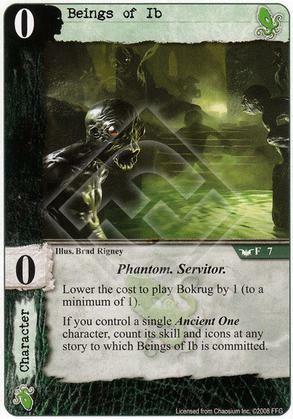 The card also has my favourite cost, and its not like Cthulu lacks ancient ones. I like the look of this card. It will still be free if you play it before Iod. I love 0 cost characters, they protect somewhat from bouncing effects (initiate) and are cheap fodder for khopesh/temple/cthulhu. When you have that single AO in play these guys are awesome and cthulhu have ways of cheating an AO into play. These are fragile and not for every deck but I like them. You can't argue with 0 cost, but this guy doesn't actually do anything on his own, making this pretty heavily a build-around card. Bokrug isn't that exciting of a card, so we should look at other Ancient Ones. (Reducing his cost to 5 or less is good, but it seems like a pretty shaky all-in strategy.) There are only a few I'd strongly consider: Iod, Nyarlathotep, and Y'Golonac, with honorable mention to Dormant Cthulhu. The elephant in the room remains the fact that you are required to have an Ancient One on the board for Beings to actually do anything, and that's easier said than done. Bokrug is terrible, so forget the first half of the Beings' ability. Yig seems like the perfect pairing to me because the main thrust of his own ability is icon-based. Not only does Yig have great icon flexibility, he can also generate extra icons on his own. Most other Ancient Ones are fine at giving Beings of Ib 4 or 5 icons, but that's nothing compared to the 10 that Yig can offer. Go big with Yig! As a bonus, if you're running a dedicated Serpent deck, the Beings of Ib are a good candidate to be sacrificed to Disguised Threat since they didn't cost you anything to begin with.